Ever wish you could tinker with the System Shock code? Now's your chance! System Shock is getting a very important delivery in the near future by way of Night Dive Studios. 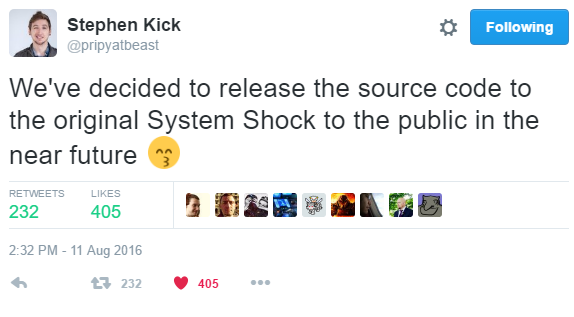 CEO of Night Dive Stephen Kick announced on his Twitter account a few days ago that the company would soon be releasing the source code to the original System Shock to the public. Obviously this is huge news, especially considering the popularity of the game after it was announced that it would be making its way to store shelves once again in the form of a reboot and an eventual sequel in the form of System Shock 3. The source code should mean all kinds of lovely fun for talented developers out there, so I'm excited to see what people come up with. And remember that there's still the reboot of the classic game with updates for modern gamers, including graphical, musical, and mechanical alterations. Terri Brosius, the original voice of SHODAN, was enlisted to re-record voice segments as well. And that's definitely something to get excited about. If you love System Shock, you should be jumping with glee right about now. Excuse me while I go do that. Someone should make a neat mobile port. Awesome! I knew it was one of the stretch goals for the Kickstarter for the SS1 remake but it didn't hit. I was hoping Night Dive would release it anyway. Good for them! There was a rumor a while back that one of the contents of a Sega Dreamcast developer disc (think the sort of thing you probably get from every major console platform vendor when you buy a dev kit) included the source code for an unfinished port of System Shock 2 to Dreamcast (I know this article is about SS1 but it reminded me of this). I think the idea was to demonstrate how you could use the Windows CE runtime to quickly port Windows games to Dreamcast, and I think SS2 was rumored to be headed to the DC at one point (would make sense since both came out in 1999) but it never happened. At various points things purporting to be the source code from that disc would float around but the nature of the thing (leaked source code) as well as no real way to verify that it was the real thing means I don't know if it ever did leak. Also I think there was at least one compiled and runnable version for Dreamcast was floating around but the word was that the framerate was in the abysmally low single digits so even if you could find it, it wouldn't be worth it other than curiosity. Then there was that patch for SS2 that leaked out a while before the GOG re-release that added widescreen options, modern Windows compatibility, etc. No one knew where this came from, and it seemed to be more thorough than just tweaking with an EXE would produce, so it seemed someone somewhere had the source code and had been working with it and one theory said that it was someone who had finally finagled the Dreamcast source code to be usable on a PC. Of course at some point the GOG re-release was announced so in all likelihood the leak was of Night Dive's work on the game and they didn't use the Dreamcast source code, they got the original as part of the licensing/porting effort. I wonder if they'll ever release that.